Kevin de Bruyne says Manchester City's weary players are grateful for some time off before their next game against Leicester. City boss Pep Guardiola, who saw his side draw 1-1 with Burnley on Saturday, has given his squad three days leave. 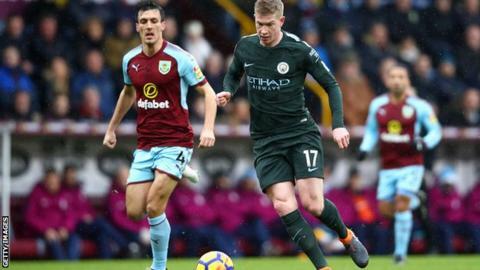 "I was feeling it from the first minute," said De Bruyne after the match at Turf Moor. "I've said it before - you feel great for 10 games, OK for 10 games, and then the rest you feel rubbish." Benjamin Mendy, Gabriel Jesus, Leroy Sane, John Stones, David Silva, Fabian Delph and Phil Foden are all sidelined for City. Belgium midfielder De Bruyne, 26, has missed only three of City's 39 games in all competitions, with the Blues still chasing four trophies this season. "You know, we've got to do what we've got to do. We've only got 15 or 16 players available at the moment so we need to get through it," added De Bruyne. The week-long gap between fixtures is City's longest since the November international break. They welcome the Foxes to Etihad Stadium on Saturday. "It will do us a lot of good," said De Bruyne. "I'm going away, it doesn't matter where!"